Samsung Galaxy S8 was recently launched in India for INR 57,900 (64GB with 4GB RAM). 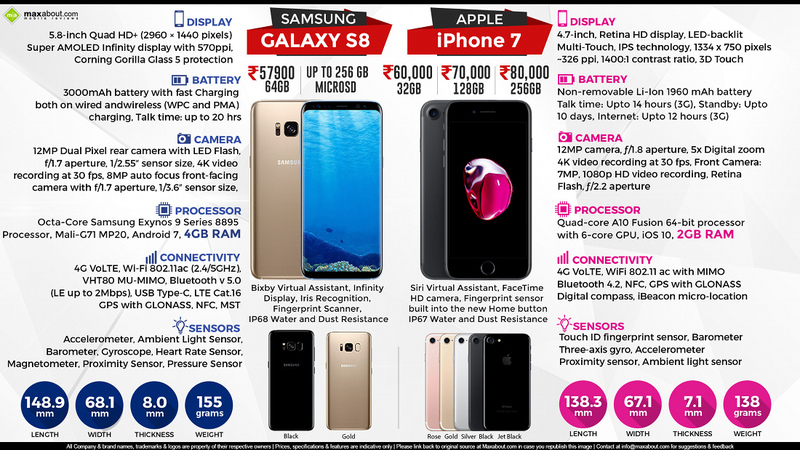 The phone rivals none other than Apple's flagship iPhone 7 and unlike the smaller 4.7 inch screen on the iPhone, Samsung Galaxy S8 comes with a 5.8 inch Quad HD+ display that comes protected with Gorilla Glass 5. The phone is built with least bezels and uses class leading Exynos 9 series processor with Mali-G71 GPU. The phone uses 12 MP dual pixel camera for the rear while front used here is 8 MP. iPhone 7, on the other hand, is good for Quad Core A10 processor and carries 2 GB of RAM. The smaller screen on the phone carries 326 ppi and may feel handy when compared to the bigger Galaxy S8. It even comes with a 12 MP camera and offers features like 4K recording and slow motion video. The phone is priced at INR 60,000 for 32 GB while gets a bump in price of INR 10,000 for 128 GB @ INR 70,000 and INR 10,000 extra for the 256 GB variant @ INR 80,000. iPhone 7 weighs 138 grams and carries a thickness of 7.1 mm while Samsung Galaxy S8 is bigger with 155 grams of weight and 8 mm of overall thickness. Click here to know more about Samsung Galaxy S8.